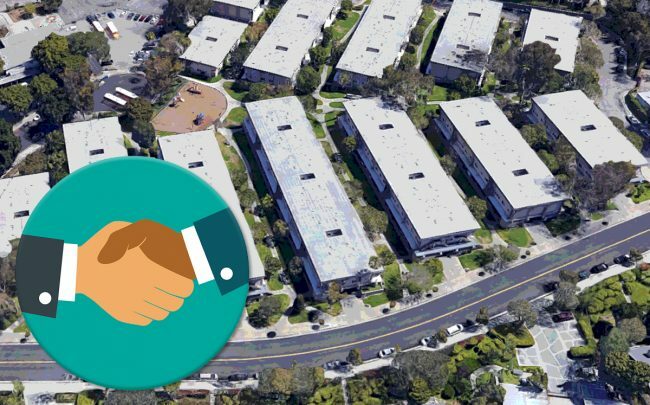 Two affordable housing developers have teamed up to buy a 213-unit multifamily complex in San Pedro, a community that has been lagging in lower-cost housing. SDG Housing Partners and Affordable Housing Access paid nearly $63 million for the building at 1301 West Park Western Drive, records show. The seller was a trustee of William Pavone, a Newport Beach resident, according to the deed. The 50-year-old complex is spread across low-rise buildings on seven acres in the Northwest San Pedro neighborhood. It’s a couple of miles from Ratkovich Company and Jerico Development are planning the sprawling San Pedro Public Market project. An affiliate of Colorado-based Bear Creek Securities, acting behind an LLC, provided a $53 million acquisition loan. Neither of the buyers responded to immediate requests for comment. Pavone, whose family has owned the site for at least five years, could not be reached. The lack of affordable housing continues to plague Los Angeles and while finding affordable housing is a statewide problem, it’s been especially hard to come by in the South Bay. A recent report from public policy group Next 10 revealed some communities in the South Bay are a very long way from reaching their affordable housing goals.